Brock Lesnar is one of the most dominant wrestlers to step inside a WWE ring, and he is arguably the biggest star WWE has ever produced. Brock is not a human being, he is a beast. A beast who dominates his opponents and leaves them wasted in the ring. Other than Goldberg, if any superstar has lost very few matches, then it's Brock Lesnar. 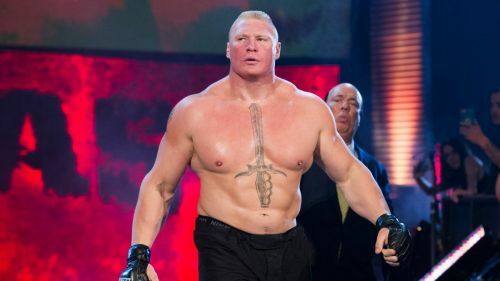 Brock Lesnar made his WWE debut on the 18 March 2002 episode of Raw. Since then, he has defeated many big superstars like The Rock, Undertaker, Roman Reigns, and many others. His run in WWE was just for 2 years and he left WWE in 2004. He made his return to WWE on 11 November 2012 but as a part-timer. He defeated Goldberg to become the champion and since then has defended the title at only 6 PPVs. For WWE Superstars, it is a very difficult task to pin Brock Lesnar, but there are 2 superstars who made Brock lose via submission. Here are the 2 superstars who made Brock Lesnar lose via submission. When Brock Lesnar made his debut in 2002, he was an unstoppable monster. He took the wrestling industry by storm, defeating superstars like Hulk Hogan, The Rock, and many other big superstars. At SummerSlam 2003, Brock Lesnar and Kurt Angle went toe to toe against each other for the WWE World Championship. Brock Lesnar dominated most of the time in the match. The bout should have ended when Lesnar tapped out to the ankle lock first time, but the referee didn't see as he was down. Brock F5ed Kurt Angle, but Angle kicked out. When Brock went for the F5 again, Angle countered and again held him in the ankle lock for the submission.